February 26, 2018 February 25, 2018 / Elizabeth T.
It may be the end of February, but LA’s going through a chilly phase right now, with temperatures dropping to almost the low forties at night. And even though I love layering with coats and scarves so much, by the end of winter, I’m definitely a little over all of the extra bulk, aren’t you? Although it may seem like a far stretch to start wearing dresses, it’s never actually too early to incorporate them in to your transitional wardrobe, especially when you can make them work for the cooler weather too! Here are some of my simple tips for wearing a dress during the colder months! Although shorter dresses can definitely look super cute, the only way to really wear them during the winter is with tights in order to stay warm. And let’s be real, a dress and tights combo is kind of conventional and expected, don’t you think? What’s unexpected, though, is a maxi dress. Though they’re typically reserved for warmer months, there’s nothing more serene and elegant than a long white maxi in the middle of winter. There’s just something magical about it that makes it look like you’ve stepped out of a literal winter wonderland. Plus, the longer length can also help you stay warm, since the skirt will cover your legs too! As for staying warm on top, a cozy knit sweater in a similar color scheme can actually do wonders! Not only does it visually add dimension to the look, the extra layer is super functional too! Rather than opting for a snugger fit, I find that a looser silhouette adds more of the bohemian chic vibe to the whole ensemble, giving it that laid-back, effortless feel. And last but not least, the right shoes definitely help to complete the whole look! In the summer months, I typically love pairing my maxi dresses with sandals, but for this wintry ensemble, it just didn’t seem right. With ankle booties, though, I’m still able to keep my feet warm without taking away from the bohemian chic vibes of the ensemble. What’re some of your favorite ways to style a dress during the winter months? Let me know in the comments because I always love hearing from all of you! 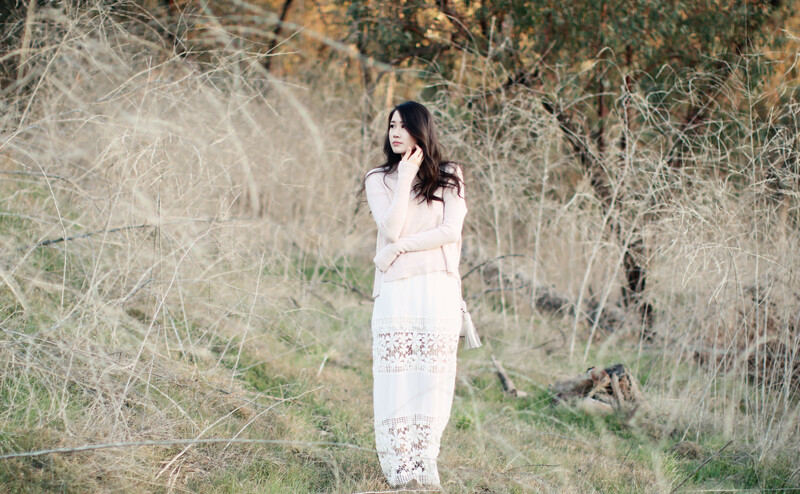 I love the dress with the lace details and it’s true that maxi dresses in winter look kind of magical! Such a cute outfit you have put together! Love how whimsical this look is! I personally love wearing dresses in winter and I think a lot of winter dresses are more in style now (which is awesome). Being effortless is hard in winter because you often have to layer, but winter dresses make winter dressing a whole lot easier! love this dress with the sweater layer! This is so beautiful and such a creative way to wear a dress in colder weather. I love the bush tone with the white! 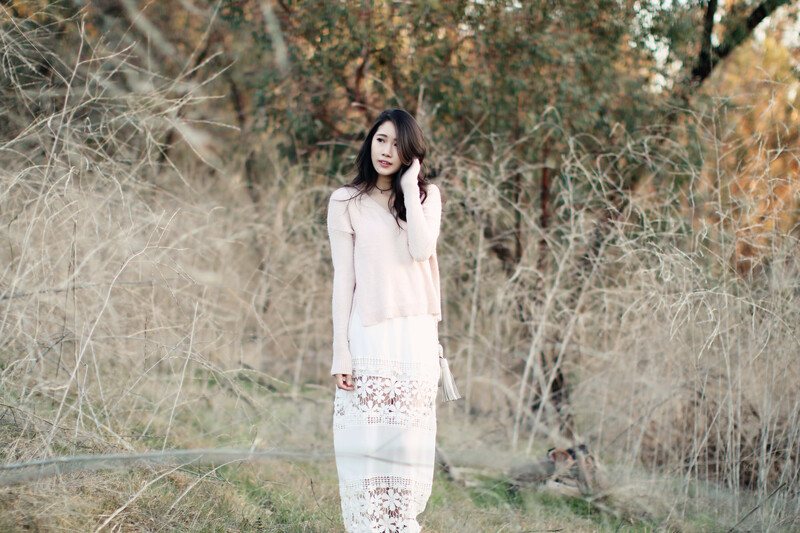 Love how you paired this sweater with the dress. It gives it a more casual look. Great piece. So romantic, love these pics 🙂 !!! That dress is just so gorgeous!! Soo gorgeous babe!! Love how you styled this look! I love dresses paired with sweaters, it makes them so cosy! Me too! Such a cozy way to wear a dress during the winter! You are looking so pretty and adorable. These are great tips. 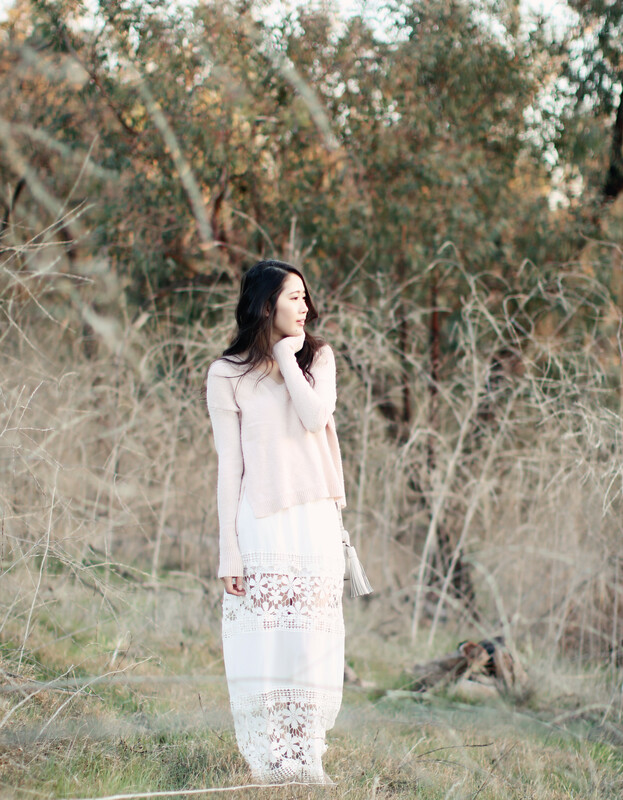 I love wearing dress with loose knitwear and boots too. So beautiful! Love the look so much! So true! A good maxi dress goes a long way. I can’t wait for the warmer weather though! This dress is absolutely beautiful and I love these tips! I wish I could wear a dress like this in winter! Thank you so much Christine! ❤ 🙂 And yesss, I've been loving sweaters over dresses lately too! Cute outfit! I wish I could wear dresses everyday if I could! Love this blog entry topic! You’ve definitely cleared things up on fun ways on how to wear dresses in cold weather! Thanks for sharing!